Seduced By Books: ROMANCING YOUR DARK SIDE TOUR Kick Off PARTY!! 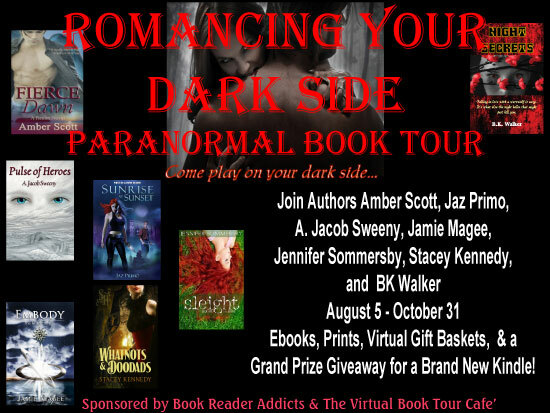 We are so excited to be participating in the Romancing Your Dark Side Tour starting this Friday, August 5th. 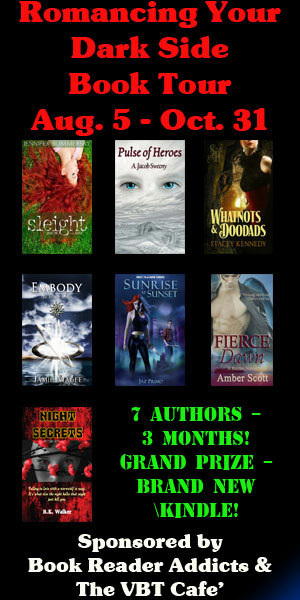 7 Authors are coming together for the next 3 months to blog, giveaway, interview and promote - HOORAY! 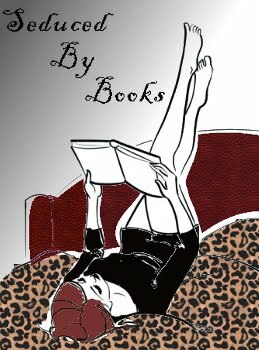 Sept 1 - Jamie Magee - Guest Blog & Giveaway - Jamie is the talented author of the Insight series - Book 1 Insight and Book 2 Embody - check her website out here and click for our reviews for Book 1 and Book 2. Sept 7 - Jaz Primo - Guest Blog & Giveaway - Fun, witty, and author of the Sunrise Vampires series - Jaz Primo will be visiting us - if you haven't found his page - click here - currently 2 books - Sunrise at Sunset (click for review) and A Bloody London Sunset. Oct 27 - A. Jacob Sweeny - Guest Blog & Giveaway - inspiring author joining us for some fun - check out her book here - Pulse of Heroes Book 1 in the Pulse Series. In addition to all the FUN - Many of the Authors are doing Giveaways not just on our site, but along the tour ride. AND 1 LUCKY WINNER will win a NEW Kindle - the comments from the posts on each site will be entered in a random drawing.